Nightly Rates: Starting at $179 per cabin. Our double unit cabins are equipped with two queen sized beds and private bathrooms. They sit on the secluded edge of our property and offer unobstructed mountain views. Our five cozy double unit cabins are clustered on the edge of our property in front of a trout stream that moose visit daily. The area is secluded and offers plenty of privacy. Each cabin has two queen size beds and a private bathroom, as well as unobstructed panoramic views toward Glacier National Park. Each of our double unit cabins have two queen size beds with Sealy Posturpedic mattresses, custom furniture, private bathroom, heat, air conditioning, a microwave and refrigerator. There’s a table and chairs for eating or writing and some cabins have a lounge chair for reading and relaxing. They also offer easy access to the property’s trout stream where moose visit frequently. 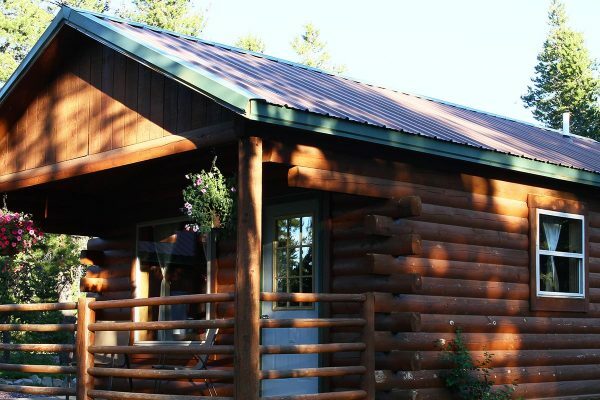 Each cabin is situated with unobstructed views of Glacier National Park’s magnificent mountains.